154 pages | 6 B/W Illus. "This widely used and highly popular book is back – in revised form. With an added chapter on the spread of functionalism throughout the world and numerous small revisions, it promises to keep functionalism growing. Both students and researchers should find it enlightening and challenging – of both theory and practice." 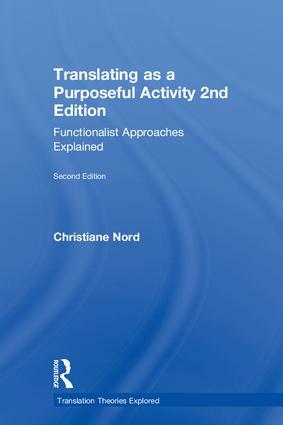 "This timely new edition of Christiane Nord’s landmark work takes functionalist approaches into the next generation. The consideration of recent trends and applications reflects the author’s deep vision and pedagogical talent. The result is a most comprehensive and readable overview for anyone seeking to understand translation as professional communication." Christiane Nord is Professor Emerita of Translation Studies and Specialized Communication at the University of Applied Sciences of Magdeburg, Germany, and Visiting Professor at several universities of the People’s Republic of China. She also holds the position of Professor Extraordinary and Research Fellow at the University of the Free State, South Africa. Her homepage can be found at www.christiane-nord.de. Translation Theories Explored is a series designed to engage with the range and diversity of contemporary translation studies. Translation itself is as vital and as charged as ever. If anything, it has become more plural, more varied and more complex in today\'s world. The study of translation has responded to these challenges with vigour. In recent decades the field has gained in depth, its scope continues to expand and it is increasingly interacting with other disciplines. The series sets out to reflect and foster these developments. It aims to keep track of theoretical developments, to explore new areas, approaches and issues, and generally to extend and enrich the intellectual horizon of translation studies. Special attention is paid to innovative ideas that may not as yet be widely known but deserve wider currency. Individual volumes explain and assess particular approaches. Each volume combines an overview of the relevant approach with case studies and critical reflection, placing its subject in a broad intellectual and historical context, illustrating the key ideas with examples, summarizing the main debates, accounting for specific methodologies, achievements and blind spots, and opening up new perspectives for the future. Authors are selected not only on their close familiarity and personal affinity with a particular approach but also on their capacity for lucid exposition, critical assessment and imaginative thought. The series is aimed at researchers and graduate students who wish to learn about new approaches to translation in a comprehensive but accessible way.